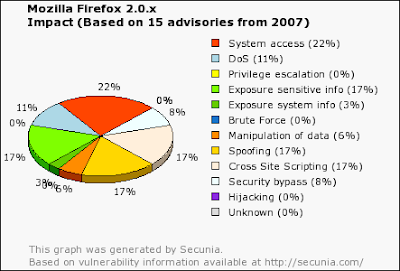 Jeffrey Jones has published a reather interesting internet browser Vulnerability Analysis of Internet Explorer and Firefox using cross-checked references of common security bulletings such as Microsoft's Security Bulletin page, Mozilla's security announcements as well as NIST, Secunia, SecurityFocus, and many others. The report does not cover a vulnerability Window of Exposure, or a statistic of exploits "in the wild" but it's still interesting. 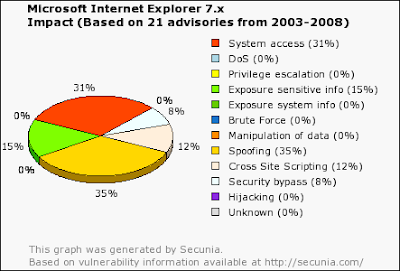 In a previous Internet Security Threat Report, IE had an average Window of Exposure of 9 days, followed by Safari with 5, Opera with 2 and Mozilla with 1, according to a Symantec Internet Threat Security Report. Here's an interesting blog response from Mike Shaver.